We're so excited to share the news! The Omega2 Pro is the next generation of our Omega2 and the most powerful IoT computer we’ve made yet. It is a standalone device – the processor, memory, gigabytes of storage, and Wi-Fi are all built-in, and it’s smaller than a breadboard. It is the culmination of everything we’ve learned since the launch of the original Omega in 2015 and we're so excited to announce that it's now live on Crowd Supply. 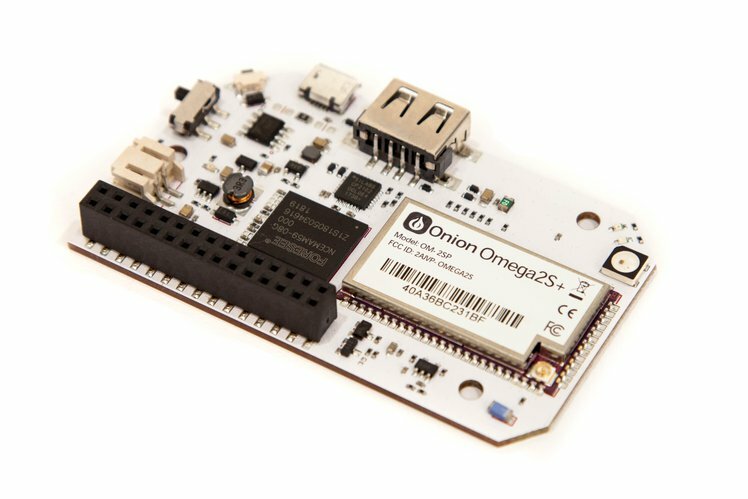 i'm thinking since you mention the onion flavor openwrt OS as being compatible with the earlier omega2[+] devices and shipping of this pro is a little over a month away that perhaps you have a build of this OS available now for current omega2 device owners to download and do some testing? also, is the price on crowdsupply a pre-release special or will the price remain as listed now after you start shipping? finally, there have been a several mentions of kernel mis-match issues for some users who needed a newer kernel than what onion OS has in order to install various packages and being unable to update. will this new OS be such that when openwrt build moves to a newer kernel that the onion flavored one on our devices will also have an option to easily update to the newer kernel if desired? thanks. @Lazar-Demin Omega2 Pro is Open Source and Open Hardware! Please let us know the schematic of the board. Thanks. 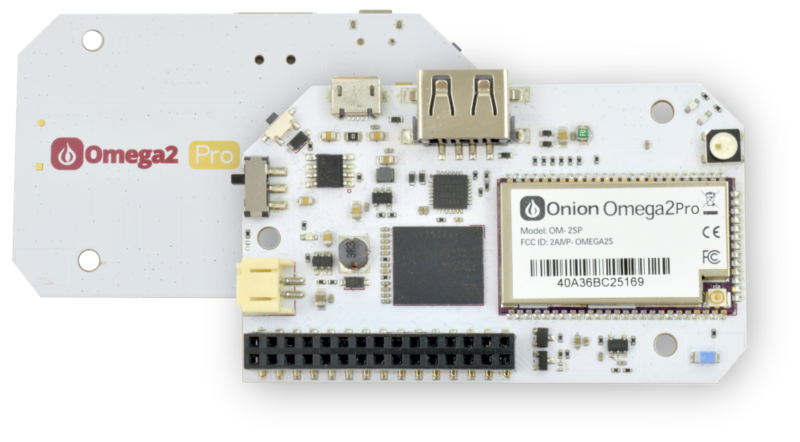 @Lazar-Demin Omega2 Pro is Open Source and Open Hardware by Onion. You are probably very busy now and therefore not able to upload a full schematic diagram. I have a much more simple request: please let us know what is the E. Power management (LiPo charger) IC on the board? Update: It seems this is the layout of this board. Update: It seems this is the schematic of this board. These two boards differ from each other and I'm not talking about the stickers. I think the board with Omega2 Pro sticker is the real one. What is the other one? BTW Are there any differences between the Omega2 Pro and the Omega2S+ modules under the shielding? @Lazar-Demin (AKA greenbreakfast) shared with us about an hour ago :-) Thank you. Yes, the Omega2 and Omega2+ will be compatible with the new OpenWRT 18.06 based firmware that is on the Omega2 Pro. This firmware will be released sometime after the Omega2 Pro ships. If you would like to test it out yourself beforehand, our build system is available on GitHub and can be used to build the firmware. The current price is crowd funding promotional price, expect it to change after the campaign is complete. Installing kernel modules with opkg: To ensure that all installed kernel modules are the exact same version as the device’s kernel, opkg has safeguards that only allow it to install kernel modules compiled by the same machine that compiled the firmware. I presume this is done because installing kernel modules into an older kernel would likely be pretty disasterous. The OpenWRT 18.06 based firmware runs kernel version 4.14, and there is a large number of kernel modules that we build and make available in the Onion package repos. If that doesn’t suit your needs, the build system can be used to compile additional kernel modules. Updating to a newer kernel requires a full firmware upgrade. I presume that OpenWRT won’t move to a newer kernel version until the next release. We’ll cross that bridge when we get to it. As you’ll see in the schematics, the LiPo charger IC is the TP4056. Regarding the two photos, the one with the sticker that says "Omega2 Pro" is an early prototype. The other photos feature a unit from our 60 unit sample run. This is what the production models will look like. The Omega2 Pro design is based on the Omega2S+, there are no differences between the Omega2S+ used in the Omega2 Pro and the Omega2S+ modules that are currently available to be purchased from us or Mouser. @Lazar-Demin There are two funny "typo"-s in the "Power Dock" section of the schematic (in the Sheet 3 of 6). The polarity of the BAT1 battery is wrong (reversed) - naturally its negative terminal must connect to GND. It seems the schematic of the board with Omega2S+ sticker was published by @Lazar-Demin here. Hardware R1.2 vs. Schematic Rev V1.0 ??? I forgot to mention that this layout belongs to the other board with Omega2Pro sticker. I updated one of my previous posts too. Formerly I supposed that the board with Omega2Pro sticker is the real Omega2Pro board because there was an O2Pro-Official-Shot on the Onion's blog (if I remember well ;-). So I 'm confused a little. @György-Farkas Regarding the layout, that was my mistake, I had mislabelled the images. The layout file in the repo has been updated, and now features the Q3 component that we added to the power supply circuit. Yes, the battery symbol in the schematic is reversed, but this is just a schematic symbol and has no impact on the actual hardware.